A science show at the Festival? Well yes, and a fun one too! There were plenty of experiments, smoke, fire and audience participation. 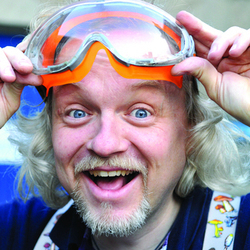 This was an educational journey with some interesting facts slipped in there for all to benefit from, Marty Jopson is an engaging host who clearly loves what he does and is easy with the audience creating no shortage of volunteers for his experiments. This is in the Fringe programme as a PG rating but in my opinion, this would benefit with an age guide of 7+, as although the experiments both delighted and amused all of those present, I felt that the younger ones struggled a bit to remain fully switched on to the theory side of the show and at times was a bit classroom like. That said though, the practical side to the science brought everyone back and I would say that it was an enjoyable experience with a terrific finale (which is still being talked about!) and if there are older children in the family then this is worth a visit.